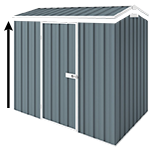 This popular Zinc EasyShed is large enough to be used for either a storage shed or a workshop. For a very attractive price you can see why it is a popular choice. This shed is comes with a wide (1.5m) double hinged door on the 4.5m side and a gable roof for extra headroom and storage space. Accessories such as a tool holder or shelf. You can increase the wall height from 1.8m to 2.1m. Swap the hinged doors for sliding doors. Add lighting with a louvre window or skylight. Products are Australian Made and meet the Australian Safety Standards. So you can rest assure it can withstand the country's harsh climate.